The Coulport Royal Naval Armaments Depot is situated on the east bank of Loch Long. 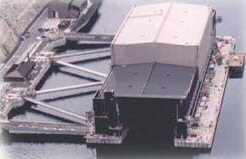 There are two jetties; one known as the Polaris Jetty and the other, pictured here, is the covered jetty called the EHJ (Explosive Handling Jetty). This is used for the handling of Trident missiles for the Vanguard class of submarines. Together with the Faslane naval base, they make up the HM Naval Base Clyde.